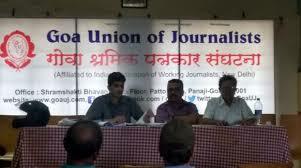 Panaji: 21/07/2018 :: The Goa Union of Journalists is pleased to announce its awards for excellence in journalism. # Cyril D’Cunha Award for photojournalism. All entries must be submitted on or before August 5, 2018. Entries must have been originally published in print or online during June 2016-May 2017 and from June 2017-May 2018 to be eligible for the respective year’s award. There is no entry fee.GUJ has decided that it would be appropriate that only stories that were published with a byline be nominated for awards. Stories without a byline will be considered, as an exception, only if they are accompanied by an endorsement from the concerned editor. Journalists can submit online links/scans of their stories/photos, in soft copy via email rather than having to hand over physical copies of their stories. Photographs will have to be accompanied by their captions as published. Entries may please be emailed to GUJ at secretary.goauj@gmail.com with the subject line “GUJ awards for excellence in journalism” also indicating which year the award is being nominated for. The last date to submit entries is August 5. The entries will be judged by an independent panel. GUJ hopes that this platform will also help to raise the bar of news and feature writing in the state.